A new survey finds the wait time for new patients seeking an appointment with a physician in 15 major cities in the United States has risen 30 percent since 2014. The survey, conducted by national physician search firm Merritt Hawkins, analyzed the responses from 1,414 doctors’ offices. Wait times for new-patient appointments were observed in five medical specialty areas: cardiology, dermatology, obstetrics/gynecology, orthopedic surgery, and family medicine. The survey indicates that Boston, Massachusetts, is encountering the longest average new-patient wait time of the 15 metropolitan areas: 109 days to see a family physician; 52 days to see a dermatologist; 45 days to see an OB/GYN; 45 days to see a cardiologist; and 11 days to see an orthopedic surgeon. The data suggest the average wait-time in general for new patients in Boston is 52 days. Average wait times for new patients in other major U.S. cities are: Dallas – 15 days; Philadelphia – 37 days; Portland – 28 days; Seattle – 28 days; Denver – 27 days; Los Angeles – 24 days. The 2017 survey also studied wait times for new patients in mid-size cities. Data show the average wait time in cities with approximately 90,000 to 140,000 people is 32 days, or 33 percent longer than in the largest cities. A list of all cities included in the survey can be viewed in the report. Merritt Hawkins suggests the onset of Obamacare – which is essentially an expansion of government-funded Medicaid – is tied to the failure of many Americans to obtain prompt health care. The survey also found that physicians accepting Medicare and Medicaid reimbursement as payment is not in keeping with the number of patients who expect to use government health insurance as their third-party payer. In the largest cities, the average rate of Medicare acceptance among doctors is 85 percent, while the rate is 81 percent in the mid-size cities. Physicians in the largest metropolitan areas are accepting Medicaid at a rate of only 53 percent, and, in the mid-size cities, 60 percent. The data suggest that many Americans who are living in cities and have purchased insurance plans through Obamacare are therefore not having access to health care, even though they have insurance coverage. 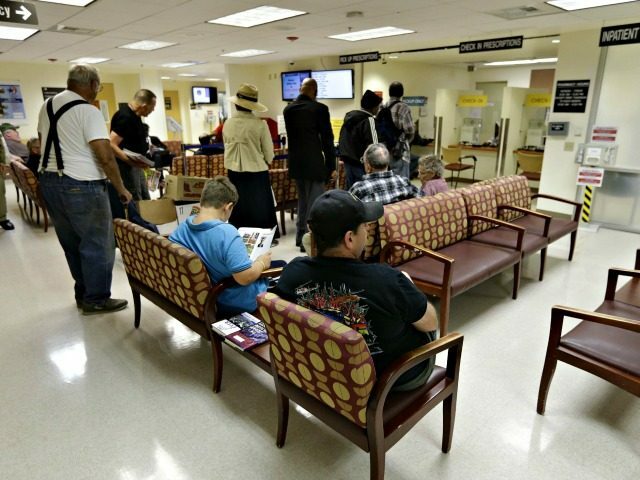 However, Dr. Gerard Gianoli, a specialist in neuro-otology and skull base surgery, recently observed to Breitbart News that Obamacare’s increase in the number of Americans on government-funded health insurance is not an achievement.